Twins 101 features practical advice and well-researched information in an easy-to-read format. 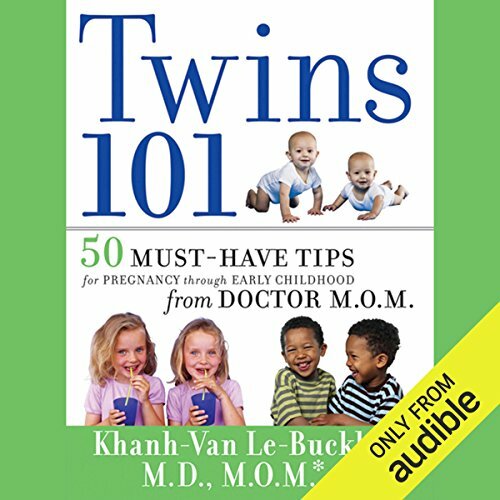 From maintaining a healthy twin pregnancy to meeting the daily challenge of caring for twins, Twins 101 guides families through each stage with insightful tips, practical advice, useful resources, and inspirational stories. ©2009 Khanh-Van Le-Bucklin (P)2012 Audible, Inc.
Great tips, concise and helpful.. easy to listen and understand. Will follow a lot of the tips. Would you try another book from Khanh-Van Le-Bucklin and/or Vanessa Hart? What was most disappointing about Khanh-Van Le-Bucklin’s story? This book is most helpful to people who have no kids and haven't had their twins yet. Otherwise, everything she mentions you'll figure out in the first month after birth. My twins are 3 months old and unfortunately I didn't learn anything from this book. I would recommend this book. Sigh. The information was very elementary. To the point of being painful. Listening to this audiobook was aggravating, even the reader seemed to read painfully slowly. I felt the author had a few insights but in order to write an entire book, needed to fill it with a lot of fluff.